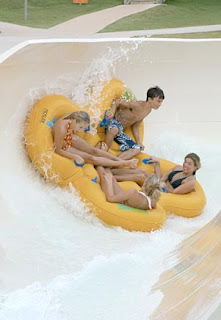 For one of the kids' Christmas presents last year, I bought season passes to Wild River Country. We have lived in Conway for over twelve years and yesterday was my first time to go. So we loaded up the car, all of our stuff (including the baby's paraphenalia, digital camera and camcorder) and made the 25 mile trip. Rachael, Terry, and Dylan, played on all the water slides while Paul, Brady and I hung out at the toddler play area. Our one year-old, Brady, had a blast. He has no fear of water. He had fun putting his face in the water and blowing bubbles, but most of all he had fun splashing around and watching the other kids play. 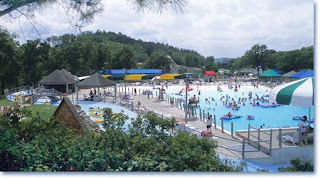 I was impressed with the beauty of the water park. All of the water parks I've been to previously have been located in the city and are made up of primarily concrete and water slides. 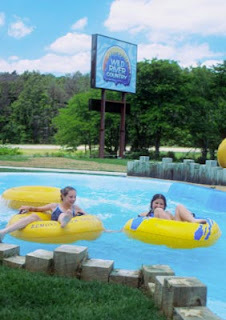 Wild River Country is located in a wooded area and the park itself has trees, wooden bridges and buildings that all blend in with the environment. After playing in the toddler area, Paul, Brady and I hopped in a tube and floated down The Lazy River. It was so relaxing, we decided to go around one more time. We then caught up with Dylan and went to a water slide designed for little kids. Paul, Dylan and Brady got in line, while I stayed at the foot of the slide videotaping the whole thing. They decided not to go through with it, however, because the lifeguard wouldn't allow Paul to hold Brady while going down the slide. The lifeguard said that Brady would have to sit in the front by himself. Paul noticed several two year-olds that were scared, so he knew that Brady was too young for the water ride. Before we left to go home, Rachael, Terry and Dylan asked me if I wanted to join them on a four-person tube and go down the Cyclone. I said, "Yeah, let's go!" Boy, was I in for a shocker. I thought it would be a fun little ride, like all the other water slides I've been on. I love riding roller coasters, jet skis and motorcycles, so I've always thought of myself as a little bit of a daredevil. I got in the tube with my back to the opening of the slide. After we all got settled, the lifeguard pushed us down the slide. That's where the fun ended - and the terror began. I can't remember when I've been so scared. It was pitch dark and we were flying fast. I screamed, "I'm scared! I'm scared! I'm scared!" And for the rest of the ride, I closed my eyes, held on tight, and screamed my head off thinking, "I'm going to have a heart attack!" The kids had a great time laughing at me, of course. I still can't believe how scared I was. It's funny now though. I told the kids I would never ride The Cyclone again. I feel old. I'm turning 44 tomorrow, so I guess technically, I am old. Well, older than I feel inside anyway. I still feel like a spry 30 year old. The years have flown by. But 44 is fine with me. I'm glad to be here and hope that I stick around for a long time, the Lord willing. We went back to Wild River Country again this afternoon and stayed for a couple of hours. We met up with my brother, Jeff and his family and had a great time. It's going to be a fun summer, I can just feel it. Enjoy the rest of your Memorial Day holiday and stay safe!